Sister Mary Julaine (Mary Jalaine) Middendorf was the seventh of ten children of her parents. Their nurturing and strong faith created a very loving environment for their family. As a child, Jalaine heard God’s call to religious life when she was in the second grade and continued to grow in that desire through high school. 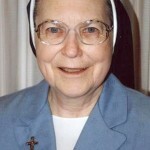 After graduating from Notre Dame Academy in 1958, Jalaine entered the Sisters of Notre Dame. 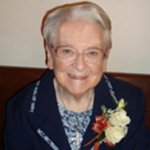 Sister Mary Julaine received her BA in Education from Villa Madonna College (now Thomas More University) in 1965. 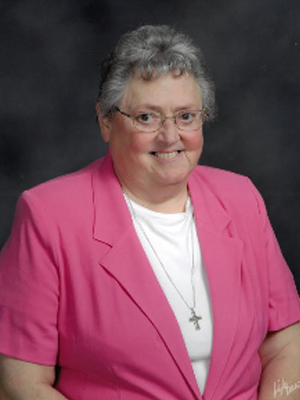 She started her ministry teaching the primary grades in the Diocese of Covington and the Archdiocese of Cincinnati. In 1971, she received her MA in Religious Education at the Jesuit University in Detroit, Michigan. 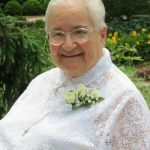 Subsequently, Sister Mary Julaine served as Director of Religious Education for twenty-nine years at several parishes and at the Covington Diocesan Religious Education Office. She enjoyed teaching and considered it a privilege to bring children and adults to a closer relationship with Jesus. Sister also started the Pastoral Ministry Department at St. Claire Health Care in Morehead, Kentucky, where she worked for three years. 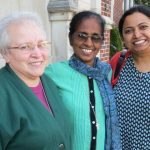 After fifty years in ministry, Sister retired but continued her community service to the Sisters of Notre Dame. Along the way, Sister Mary Julaine’s compassionate heart showed itself in concern for the poor. This prompted her to volunteer at a local center for the distribution of food and clothing throughout the year, and gifts at Christmas. Friends could count on nameday and birthday cards from sister, usually enhanced by bright stickers. She was generous with her time and often did little kindnesses for others without needing to be asked. She also loved to decorate, bringing lively color to the dining room of the local convent, especially at Christmas and Easter. Sister Mary Julaine was a very affectionate person. She loved both giving and receiving hugs. She also had a great fondness for animals. Thus, she delighted in visits from a close friend, once her student, who often brought along her dog. One retirement activity she especially enjoyed was the weekly art class conducted for several years by now deceased Sr. Mary Reina. In spite of macular degeneration, Sister Mary Julaine continued to enjoy painting long after the classes ended. Her colorful products were noticeable in her room and in her frequent little gifts to others. While sister had suffered from asthma for years and was generally declining in health, her death seemed sudden. On January 19, 2019, just a few weeks after a diagnosis of terminal lung cancer, Sister Mary Julaine went home to God very peacefully, surrounded by her loving sisters and family. May she live in joy and peace in God’s loving embrace for all eternity.